The Australian Lunar coin series celebrates Chinese astrology and the Chinese zodiac. The 12-year series features releases marking the Year of the Mouse (2008), Year of the Ox (2009), Year of the Tiger (2010), Year of the Rabbit (2011), Year of the Dragon (2012), Year of the Snake (2013), Year of the Horse (2014), Year of the Goat (2015), Year of the Monkey (2016), Year of the Rooster (2017), Year of the Dog (2018) and Year of the Pig (2019). In 2011, The Perth Mint’s internationally renowned Australian Lunar Gold PROOF Coin Series II celebrates the Year of the Rabbit, the fourth animal in the 12-year cycle of the Chinese zodiac. These superb releases are perfect for people born in the Year of the Rabbit – 1927, 1939, 1951, 1963, 1975, 1987, 1999 and 2011 – who are regarded as intelligent, articulate, compassionate and loyal. The front of the Lunar Rabbit coin can be considered as classic for most of the Australian gold coins, with the Ian Rank-Broadley effigy of Her Majesty Queen Elizabeth II, the nominal value and the inscriptions "ELIZABETH II", "AUSTRALIA", the year "2011"and" 9999 Gold ". 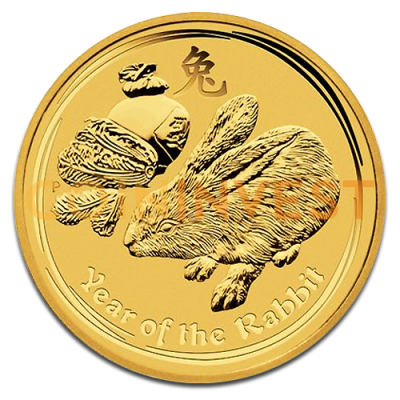 The Lunar Rabbit coin appeals to to investors and collectors because of its very limited supply, the variety of denominations and their undeniable beauty. The coin was issued as legal tender under the Australian Currency Act 1965 and has a fine gold content of 99.99%. The 2011 release is available as individual 1oz, 1/2oz and 2oz coins.